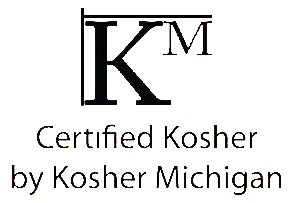 by serving a vegetarian-vegan plant based diet using the best products we can procure. All of our food is prepared in-house with love and careful attention to detail. Since opening, we have supported our local farming community through direct contact with farmers and through farmers markets. Every incoming order is inspected to ensure it conforms to our standard of quality. Also, as part of our commitment to sustainability, we have transitioned from non-renewable carryout materials to compostable and recyclable products. All of our packaging materials—bottles, can and plastics—are recycled and most of our vegetable trimmings are composted. We look forward to continuing our service to the community and thank our customers for their loyal support. Please Note: All of our food is prepared without animal products except where noted. Our food is prepared to order to maintain its freshness and integrity. Please be patient. Nuts and soy products are used in many of our dishes, if you have allergies, please advise your server. Free street parking around the facility is available. Metered street parking nearby. 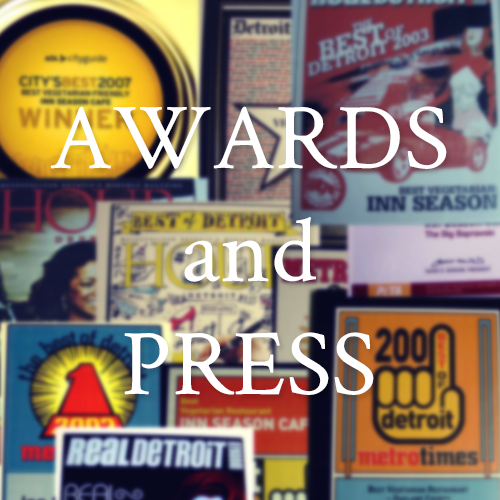 Tuesday thru Thursday: 11:30 a.m. -9:00 p.m.
Friday : 11:30 a.m. – 9:30 p.m.
Saturday: Noon – 9:30 p.m.
Sunday for Brunch: 11:00 a.m. – 3 p.m. Dedicated to your Well-being for over 34 years! 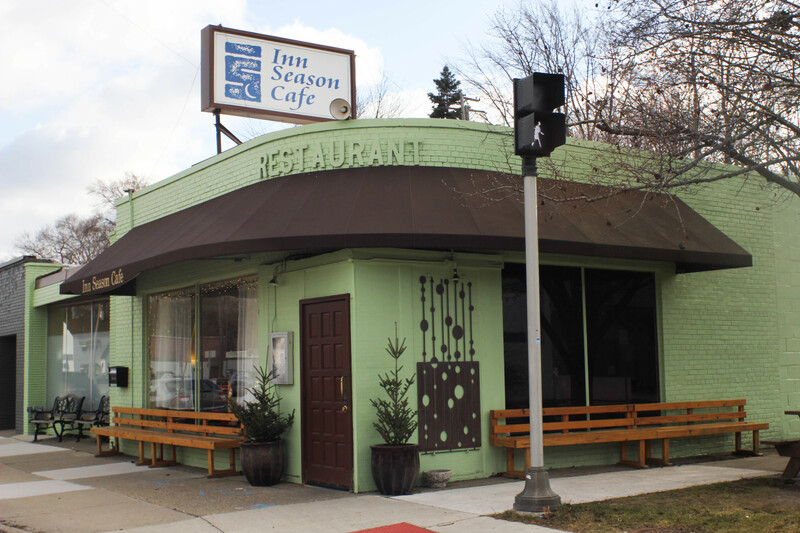 The Inn Season Cafe is the premier organic vegan/vegetarian restaurant in Michigan. 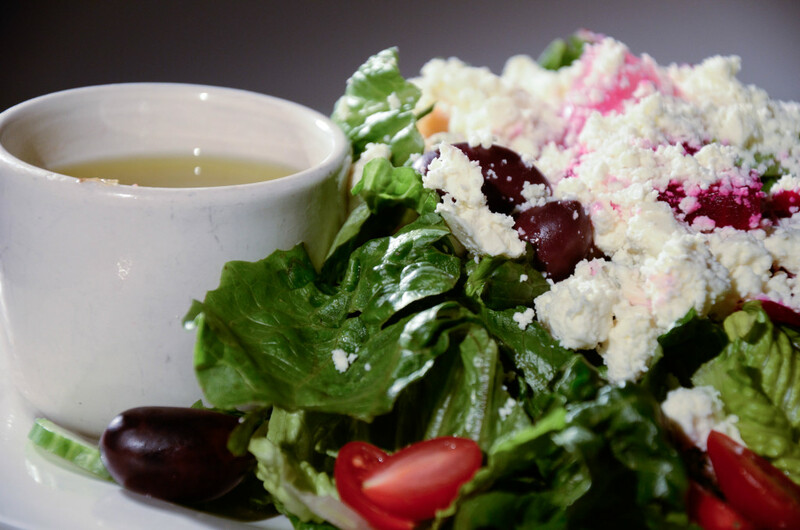 Since 1981, we have strived to present our customers with skillfully prepared dishes using the freshest organic, seasonal, and locally grown ingredients. 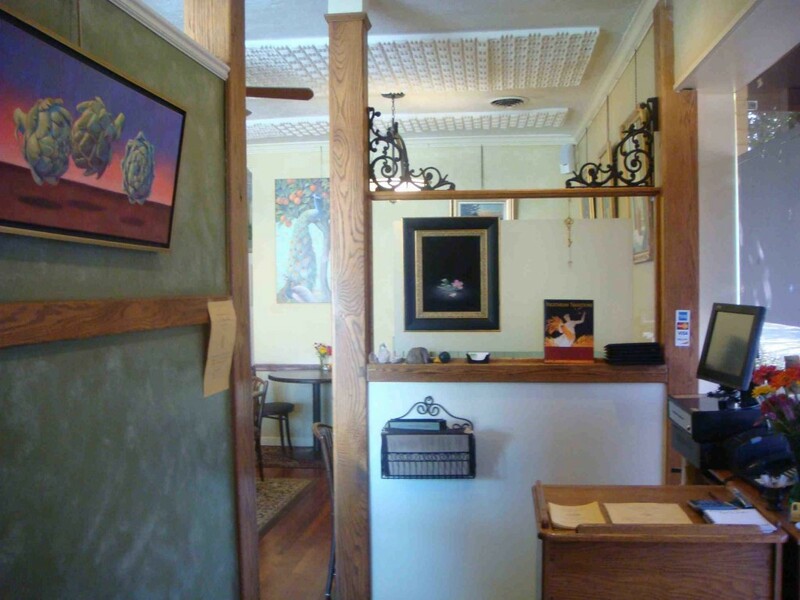 Our menu reflects the best of classic, as well as inventive world cuisine. We believe good food is intrinsically healthy and is meant to be hearty and satisfying. Though we are dedicated to serving the vegetarian and vegan community, we hope everyone will enjoy the home-cooked flavors of the Inn Season Cafe! 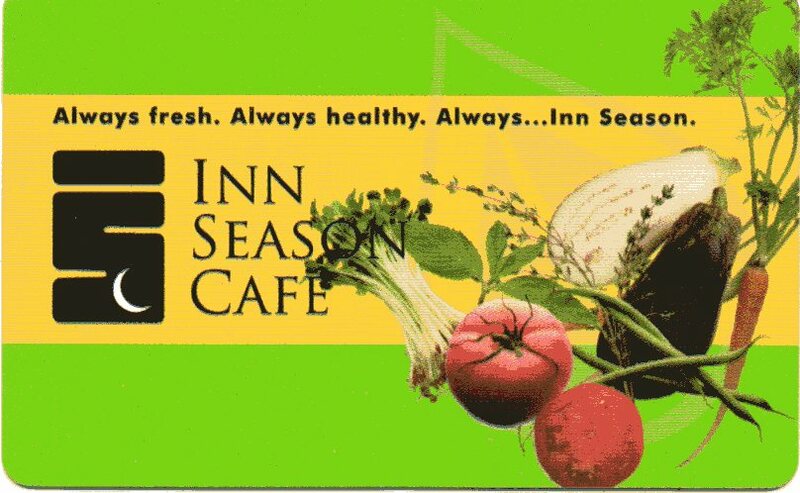 We at the Inn Season Cafe are dedicated to your health through our commitment to excellent vegetarian cuisine. Our inspired creations are comprised of a seasonal array of organic ingredients, grown without the use of pesticides and other chemicals which have debilitating consequences for both our farmlands and our health. Supporting local organic farming acknowledges the interconnectedness of our environmental, spiritual and physical well-being. We are delighted to nourish your body with delicious meals served in a vibrant and friendly atmosphere. We invite you to enjoy the good food that comes fresh from the farm to your table. NOTE: All of our food is prepared without the use of animal products (unless otherwise noted on the menu). Most foods and grains are organically grown with as many as possible from local farms. The soups are our own recipes, using fresh herbs, and all foods cooked in healthy oils. We use no food colorings, preservatives, refined sugar or bleached flour, microwaves, etc. Our bread is baked daily from organic wheat and rye grains. Most importantly, our food is prepared with a passion for what we do. The Inn Season Cafe combines a clean, modern design and natural woods to create a soothing and comfortable dining retreat in Metro Detroit. The Inn Season Cafe is the perfect ambiance in which to experience innovative cuisine that is both delicious and life-enhancing. Whole-wheat tortilla** filled with black beans and cheese or vegan Daiya cheese. Served with avocado, tomato, onion, green olives, lettuce and house-made salsa. **Gluten-free Brown Rice Tortilla may be substituted for additional 50¢ charge. Millet tabouli and traditional hummus made with the added zest of roasted sweet red peppers. Garnished with roasted beets, artichoke hearts and olives. Served with fresh baked flat bread. Traditional hummus with the added zest of roasted sweet red peppers. Served with fresh baked flat bread. Shiitake mushroom caps sautéed with toasted sesame oil, tamari, mirin and garlic. 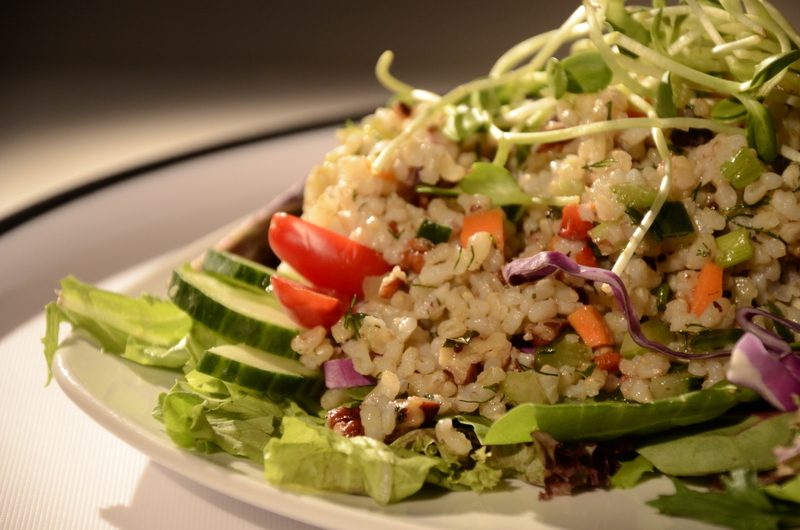 Garnished with brown rice and sesame seeds. Mesclun lettuces garnished with tomato, cucumber, marinated red onion and sunflower sprouts. Served with your choice of dressing. Caesar-style salad tossed with Caesar dressing using romaine lettuce, tomato, marinated red onion, cucumber and topped with house-made, whole grain herb croutons. Prepared without eggs or anchovies. 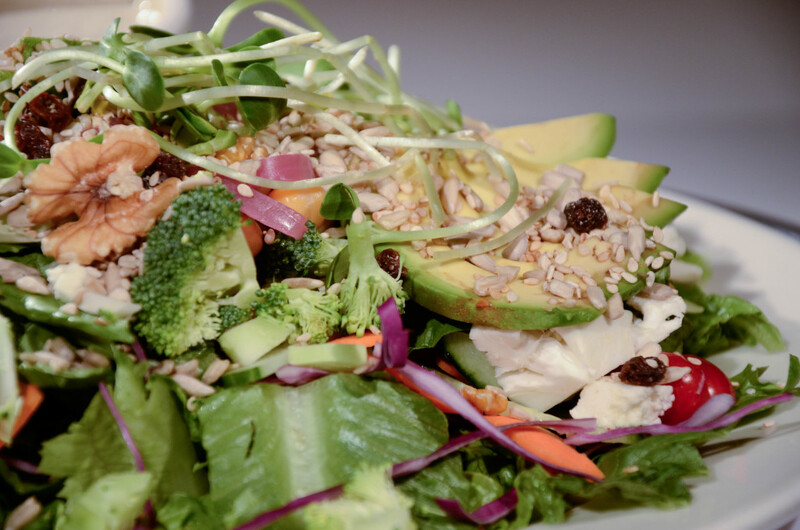 Mesclun lettuces tossed with balsamic vinaigrette and topped with sunflower sprouts, tofu, raisin-nut mix, tomato, marinated red onion, cucumber and your choice of cheese, vegan Daiya cheese or avocado. Mesclun lettuces tossed with balsamic vinaigrette and topped with garlic-roasted walnuts, bleu cheese, tomato, marinated red onion, cucumber, balsamic raisins and sunflower sprouts. Romaine lettuce, roasted beets, feta cheese, tomato, garbanzo beans, cucumber, Kalamata olives and marinated red onion. Served with Greek dressing on the side. Whole-wheat noodles tossed with Greek dressing, tomato, cucumber, Kalamata olives, roasted beets, artichoke hearts, marinated red onion and topped with your choice of Feta cheese or garlic-roasted walnuts. Brown rice tossed with sweet red peppers, cucumber, scallion, celery, carrot, fresh herbs, pecans, currants, garlic, lemon and olive oil. Served on a bed of mixed greens. Robust salad of romaine lettuce, broccoli, cauliflower, carrot, red cabbage, tomato, cucumber, garbanzo beans, sunflower sprouts, marinated red onion and raisin-nut mix. Served with your choice of dressing. Choose from the options below to add to any salad. 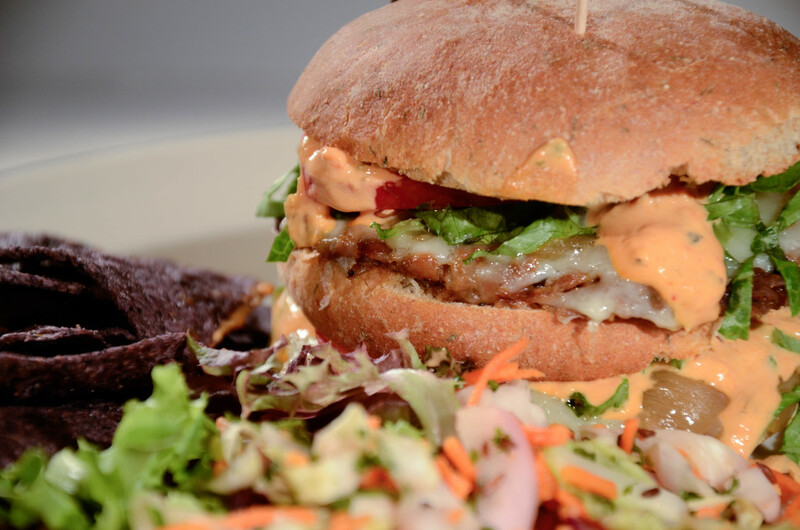 House-made multi-grain patty (oats, lentils, brown rice, millet, cracked wheat, cornmeal, sesame seeds, sunflower seeds) served on our whole grain bun with cheese or vegan Daiya cheese, sautéed onions, lettuce, and tomato. Served with coleslaw, blue corn tortilla chips and your choice of sauce. Flavorful tempeh (cultured soy) patty served on our whole grain bun with cheese or vegan Daiya cheese, sautéed onions, lettuce and tomato. Served with coleslaw, blue corn tortilla chips and your choice of sauce. Flavorful tempeh patties served double-decker on our whole grain bun with cheese or vegan Daiya cheese, sautéed onions, lettuce and tomato. Served with coleslaw, blue corn tortilla chips and special Thousand Island sauce. Baked mushroom cap (seasoned with balsamic vinegar, fresh basil, tamari) served on our whole grain bun with cheese or vegan Daiya cheese, sautéed onions, lettuce, and tomato. Served with coleslaw, blue corn tortilla chips and your choice of sauce. Made with our own Tuscan crust using roasted garlic, fennel, organic whole corn meal and organic wheat flour. Cheese or vegan Daiya cheese and tomato sauce. Sun-dried tomatoes, capers, garlic, caramelized onion, garlic roasted walnuts, tomato sauce and cheese or vegan Daiya cheese. Klamata olives, organic feta cheese, artichoke, green pepper, red onion, tomato sauce and cheese or vegan Daiya cheese. Mushrooms, broccoli, red onion, green pepper, green olives, tomato sauce and cheese or vegan Daiya cheese. Portabella mushroom, garlic roasted walnuts, capers, fresh basil, tomato sauce and cheese or vegan Daiya cheese. Fresh tomato, fresh basil, Kalamata olives, tomato sauce and cheese or vegan Daiya cheese. Spinach, garlic roasted walnuts, Kalamata olives, tomato sauce and cheese or vegan Daiya cheese. Start with cheese or vegan Daiya cheese, add tomato sauce and then your choice of two items from Traditional Toppings and two items from Gourmet Toppings. 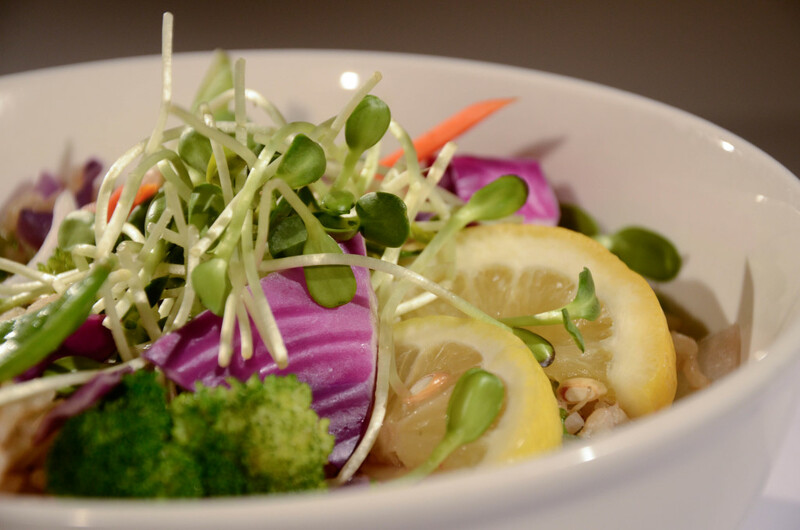 Colorful mixture of fresh broccoli, cauliflower, celery, carrot, red cabbage, onion and snow peas sautéed with tamari and served with organic short-grain brown rice. Served with shiitake-miso sauce on the side. Mild peanut sauce and sautéed tofu added to Classic stir-fry. Sea vegetable, sautéed tofu and sesame seed garnish added to Classic stir-fry. Served with shiitake-miso sauce on the side. Fresh ginger and toasted cashews added to Classic stir-fry. Served with your choice of peanut sauce or shiitake miso sauce. **Gluten-free Brown Rice Tortilla for additional 50¢ charge. Avocado may be substituted at no charge for a “no cheese” selection. Blue corn tortilla chips topped with pinto beans, green pepper, tomato, green olives and red onion. Baked with cheese or vegan Daiya cheese. Topped with avocado and served with a side of house salsa. or vegan Daiya cheese. 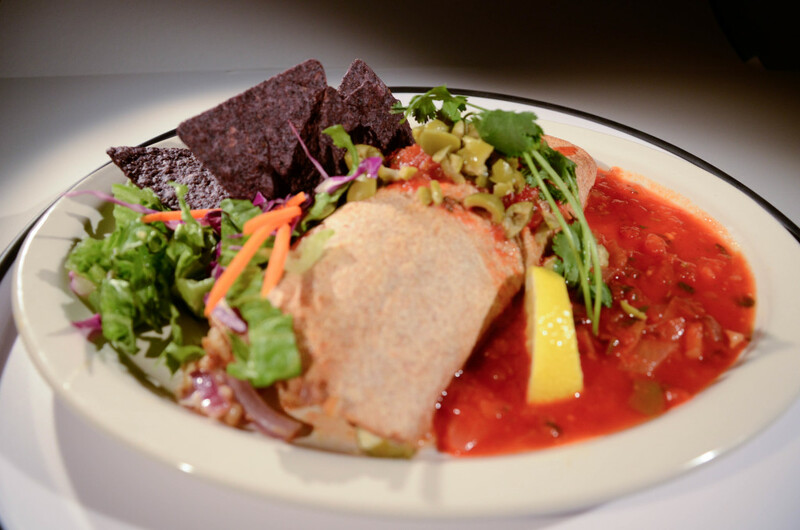 Served with house-made ancho chile salsa, sautéed onions, tomato, green pepper, green olives, lettuce and brown rice. Whole-wheat tortilla** folded over black beans, onion, tomato, green olives and cheese or vegan Daiya cheese. Served with avocado, lettuce, tomato, red onion, green olives and house salsa. Whole wheat tortilla** filled with pinto beans, brown rice, lettuce, tomato, onions and cheese or vegan Daiya cheese. Served with house salsa, green olives and blue corn chips. Rich house-made marinara sauce over whole wheat noodles. Fresh grated Asiago cheese or vegan Daiya cheese tops off this dish. Can be made with baked cheese for an additional $1.50. Brown rice, steamed kale, sea vegetable, and your choice of sautéed tofu, tempeh, or adzuki beans (SF with this option). Served with shiitake-miso sauce and garnished with The Brinery saurkraut. Whole-wheat noodles with shiitake-miso sauce and your choice of sautéed tofu, tempeh or sea vegetable (SF with this option). Served with steamed broccoli. Garnished with nori strips, daikon, scallions and sesame seeds. All fruit. A refreshing blend of strawberries, bananas and apple juice. Start with organic carrot and add any of the following: apple, beet, celery or fresh ginger. Our house tea. A traditional twig tea, rich in minerals. Sweet Indian style tea with soy milk. Hot or Cold. Made fresh in the morning while you're still sleeping. House-made with organic grains and sweeteners. Our house mix of oats, nuts, seeds, cornmeal, raisins and maple syrup. Served with organic milk, soymilk or yogurt (traditional or soy). Three organic multigrain pancakes served with Pure Maple Syrup. Our house-made bread dipped in a vanilla egg batter and served with Pure Maple Syrup. Vegan Option Available. Organic free range eggs baked with herbs, cheese and seasonal vegetables. Served with roasted Yukon Gold potatoes, smoked maple tempeh and cornbread. Scrambled organic free range eggs or scrambled tofu with corn tortillas, black beans, green chili sauce and garnished with tomato, green pepper, onion and olives. Scrambled tofu served with smoked maple tempeh, roasted Yukon Gold potatoes and cornbread. Scrambled organic free range eggs with seasonal vegetables and cheese. Served with smoked maple tempeh, roasted Yukon Gold potatoes and cornbread. See SPECIALS Menu. Pinto beans, roasted Yukon Gold potatoes and scrambled tofu or scrambled organic free range eggs rolled into an organic flour tortilla. Served with house made salsa and garnished with tomato, green pepper, onion and olives (sour cream upon request). Organic udon noodles, spinach, tofu, carrots, scallions, ginger, sesame oil, daikon and garnished with nori strips. (Fruit Juice Sweetened, No Sugar) Choose from: Raspberry, Black Cherry, Grape, Cranberry, Peach, Mango, Mandrin Lime. Regular and Decaf. House blend. We’re prejudiced, of course, but we think an Inn Season Cafe Gift Card is a great way to show appreciation and caring to a friend, associate, or someone very dear to you. It doesn’t have to be an occasion, just that random act of kindness or spontaneous expression of love. Go ahead, make someone happy. The Gift Cards are without restrictions and may be used any time or day the Cafe is open for business. Please Note: If the gift card is to be mailed to someone as a gift, type your message (limit 255 characters) in the ‘Special Instructions/Requests’ area of the form. This form is reached by clicking the ‘Buy Now” button above and proceeding through the checkout process. Open Easter Sunday, Regular Hours!